Extend your reach to get at fasteners in tight spots using the 7-pc. 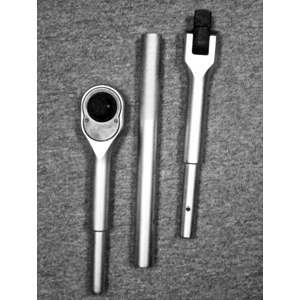 3/4" and 1" Drive Ratchet/Extension Bar Set by Extreme Torque. Made from drop forged, heat-treated chrome vanadium steel, and triple chrome plated for ultimate durability, these tools are made to last. Notches on extensions securely lock onto ratchet drive, and a spring-loaded ball bearing locks onto sockets. The non-slip knurled band allows fingers to grip and turn shaft.